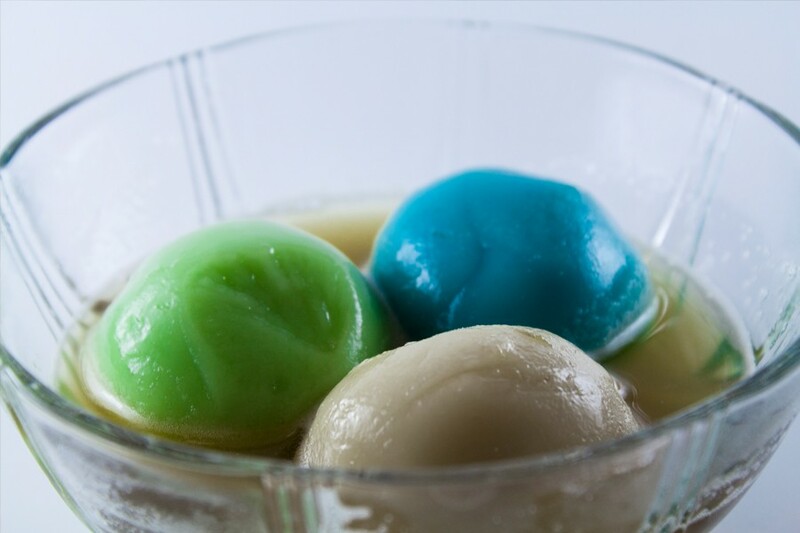 Tangyuan, or tangtuan, or yuanxiao, is a traditional Chinese dessert or snack. Tangyuan is little filled balls that are served in a sweet soup. It’s made from glutinous rice flour, and water. While there’s usually a filling, it’s not always required. The filling is usually made from black sesame seed paste, but they can also be filled with adzuki paste, chocolate, fruit preserves, or anything you can think of. I had a difficult time finding black sesame seeds, so I just made tang yuan with adzuki paste. Tangyuan is served at festivals and celebrations, ranging from the Lantern Festival, weddings, the Winter Solstice festival, and so on. The name ‘tangyuan’ translates to “round balls in soup”. In southern china, there is a story that says a past emperor, Yuan Shikai, didn’t like the previous name of the food, yuanxiao, which sounds similar to the phrase that meant “remove yuan”. The story goes that he disliked it so much, he changed the name to what it is today. Although in southern china, sweeter fillings are more common, northern china tends towards saltier fillings, with meats and spices. You can fill tangyuan with pretty much anything you can think of, from sweet to savory. When making these, it’s best to keep them small, and not make them too big, so that they’re easier to eat. 2. Fill the pot of beans until water just covers them. Bring to a boil, then lower the heat to a simmer. Keep them simmering for one to one and a half hours, or until the beans are easily squished between your fingers. You will have to add water and gently stir the beans around occasionally. 3. Drain the water again, but don’t rinse the beans. Turn the heat to high, and add the sugar. Stir until the sugar is syrupy, and when you stir you can see the bottom of the pot for a second or two until the syrup covers it again. 4. Turn off the heat and remove the pan from the burner. At this point, transfer the beans and syrup to some sort of container. You can smash them up a little, leave them whole, or even puree them for a smooth texture, depending on your tastes. Cover and set aside. refrigerate if you won’t be making the rice dough for more than a few hours. 5. For the dough, it’s pretty simple. Mix the water and the flour then dump onto counter and knead until smooth. Cut into thirds and cover two of the thirds. 6. Roll one of the thirds into a log about an inch thick. Cut off a piece, shape into a ball, and flatten to ¼ inch thick. Place some of the filling into the middle, then fold the dough around the filling. Shape into a ball, and set aside. Repeat with the rest of the dough and filling. 7. Once your balls are formed, cover them. 8. Combine the syrup ingredients in a pot, and bring to a simmer. Let simmer until the sugar is dissolved. 9. Once brown sugar is dissolved, drop a few of the tangyuan balls in at a time, and let cook until they float for 2 minutes. 10. Serve in some of the syrup while hot. * Walmart has “small red beans” these are NOT adzuki beans, though they look similar.